Desola Olajuyigbe, daughter of the first military governor of the defunct Western State, reflects on the life and times of his father. She also speaks about her interest in the families of gallant soldiers who are left to suffer after the death of their breadwinners, the motivation behind the Adekunle Fajuyi Education Trust and the scholarship scheme for indigent army officers’ kids. JANE KOLADE met her in Lagos. Fifty years after your father’s demise, how has it been? My situation is peculiar because my mother remarried. So, I didn’t really feel much of the impact of his death. Fortunately, my stepdad filled the gap very well, and I am very grateful to him for that. My mum had two children by my dad. However, even though our father died when we were young, our stepfather saw to our education, and for that, I will ever be grateful to him. He has passed on, but sometimes, I wonder what it would have been like having one’s natural father to raise one, and what would have happened. That was in 1968, about 48 years ago. You did not miss a breadwinner, as you were fortunate to have had a father -figure to raise you. What about you other siblings? Growing up, my first conscious contact with them was in secondary school. My elder brothers were working in Ibadan at the time. So, I would go and look for them. From the stories I was told, it was kind of rough, and they had to look out for themselves. There were challenges, but we are all past that now. God has been good to us. What is your take on the state of affairs in Nigeria? Do you think much has changed, especially with regards to the issue of corruption? The society as a whole, not just individuals have a part to play. Back then, individuals were more conscious of toeing the line. Today, many have gone out of line. The fear of God is lacking in so many, but back then, we saw many of the investments, facilities, and policies put in place by past governments; even the military government. There was accountability, and the consciousness that Nigeria had to be developed. Sadly, that development is stunted. We have not gone beyond what it was back then, or at least not much. I think it is simply because people are not accountable for their actions and nobody is bringing them to book. So they get away with a lot of things. 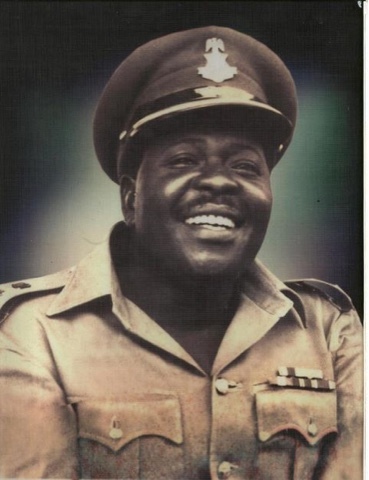 In your opinion, do you think that there are still officers of your father’s ilk who share your late father’s philosophy in the Nigerian army today? It is rare to find, and I am not sure if we can find somebody who would say, “You are not going with my guest alone, take me along.” But, I must say that, it was what he signed up for. He must have believed that as a soldier, gallantry was part of what he signed up for. Fortunately, such a situation that required people to do that has not come up. Having said that, we do have quite a number of gallant soldiers sacrificing their lives to see that Nigeria can remain one. They are fighting insurgency; the likes of Boko Haram. If they were not gallant, and if they did not believe in Nigeria, they would not be taking the risk. So, I believe that we still have such traits in our soldiers. Some soldiers were recently court-martialled, although the men in question complained that they were not well kitted, or trained for operations…. I do not know the structure of the army. So, I would not want to go into all that, but I do know that the army takes care of its own. I don’t really know what happened, but they are very protective of their own. Your dad passed when you were three years old, does that mean that you have no memories of him? Not at all. He died along with Aguiyi Ironsi, and it took a while for their bodies to be released. So, the funeral didn’t take place for quite a while. What I do remember is that the funeral scene, with a lot of music, and loud sounds. It made an impression on me. My younger sister was a year old at the time, and somebody held her, but I was standing by, and I kept picking up her bottle, and giving it back to her each time it fell. But, I didn’t understand what was going on, but I knew that something was going on, and that there were military men there, and they were well dressed. But, I did not know what was going on as nobody told me anything. Most of the things I got to know, I read about, until I reached out to my brothers, and got answers to many questions. They probably thought that they were protecting me, but I wasn’t told much, until I became an adult. Did any of your siblings join the army, or show any interest in the army? No, not at all, but I had a fascination with the navy at some point. My mother was not favourably disposed to that. So, I never go to do anything about it. In the past, the army would take over governance claiming that politicians were not doing a good job. Do you think that Nigeria could ever witness another coup? No. The world has gone beyond all that. So, you believe that the army has returned to the barracks for good? Well, they are fulfilling their purpose by serving the nation, and defending the territorial integrity of the nation. That is why they signed, and with the Boko Haram scourge, they have a lot on their hands. I don’t think they would have the time to consider coming back to government. Has there been any form of assistance given to your family, since your father’s death? What I know is that the gratuity was made available, but I can’t say much about our situation. But, as I earlier mentioned, my stepdad saw to our education up till university level. I don’t know what would have happened if my mum had not remarried. And as I said, my elder siblings went as far as they could by themselves. The army did not interfere. But, is there something on ground for the widows and orphans left behind by soldiers who make the ultimate sacrifice for their country? It depends on how they die as I have had the opportunity to speak to military widows up North. There is some amount given to them to sustain the family, get another accommodation, and see to the education of their children. Some of them said that they were promised that their children would be educated to university level, and they are still waiting on that promise. They need a voice; somebody to help/ speak to the government on their behalf. They lost a breadwinner, and not everyone will be as fortunate as I was. I also heard stories of children dropping out of school, going into prostitution, drugs, with many going into the streets. And if we don’t do that now, no one knows what will happen, especially as we are talking about change. The change should also affect the people that fight, and put themselves at risk for the nation. Something should be done to lessen the suffering of the family, especially as it’s a sudden thing. The soldiers die on the field. What happens to their children? How are we sure that they are well taken care of. Are there people that can speak on their behalf? From your experience, it means that there is a system for welfare of military orphans and widows as at now? There probably is a system, but it is not effective. Remember I said that the army looks after its own. There probably is, and as many of the widows claim, there are many forms, to fill, and processes and procedures to follow. Sometimes they are told that forms are not available, so some might just get discouraged and give up, if they are unwilling or unable to through all the stress. Some go through it to get money to start a business to get by, some also claim that it involves a lot of travel, and money; which they might not have. A woman might have to travel from Lagos to Bornu State for her claim. Why does she need to go that far? There should be somewhere around their location to source their requirements. With the trauma of losing a loved one, and then still have to travel that distance. The system has to be made much more user friendly than it presently is. A man puts his life on the line for his country, and he discovers that should he die there is nothing on ground for his children and loved ones, do you think it could be a reason people get involved in corruption, to provide for the unexpected? There really is no justification for that. And it is not only about soldiers here. You are in service, and at the end of the day you will be paid your pension, or your gratuity. You have also had the opportunity to raise a family while in service, I don’t think there is any justification for dipping your hand into the till to take what does not belong to you. What is there is for the common good. How old was your mother when your father died? She was twenty nine years old at the time. In recognition of the 50th anniversary of your father’s demise, are there plans to celebrate him? Yes. We are planning a memorial for his anniversary. It happened on the 29th of July. So, we are marking it that day. We will be launching the Adekunle Fajuyi Trust that day. The main thrust of the trust is to create an enabling environment to help the loved ones of our fallen heroes. Things like giving scholarships to help with their children’s education. Also, my father had a passion for agriculture, and also education. One of the things he did while in office was the establishment of the University of Ife in its present location. From the stories I heard, any time he was on leave, he would return to his farm in Ado Ekiti. He served in Kaduna, Enugu, and the Congo during the Congo uprising. But he had a farm he returned during his leave. It had crops like Oil Palm, Cocoa, Yams and so on. So he had a passion for agriculture. And that is one of the key areas the trust will be looking at; establishing an agricultural venture for these army orphans. We have all been asked to go back to the farm, and with the crash in Crude Oil prices, we might have no choice. Nigeria cannot live on Oil. If you look at the old Western region, many of the investments and facilities provided by the government were not done with Crude Oil money, it was Cocoa money. We have to go back to our roots, as the things are all still there. We just need to up our game, and do things right. And God helping us, we will be able to achieve our purpose. Over the years, some people have consistently marked the 29th of July. There are also people who have been very supportive of the family. A couple of years ago, he was posthumously awarded the Omoluabi award. The trust is not only for military orphans, but for young people who aspire to succeed, but are hampered by lack of funds, probably because they have lost a breadwinner. This will enable them contribute their own quota to the society, not just be at the mercy of uncles and aunties. Yes, he was very fluent in Hausa, Ibo, yet a Yoruba man. He was also very pan Nigerian. And I know that he was admired not just by Yorubas, but by Nigerians from different parts of the country. Another thing is that many of our children don’t know much about our history. I believe that Nigerian history should be revived in our schools. It is sad. If you don’t know about the past, how do you work towards the future? What do these young ones build on? Not on social media, parties, and all that. They need a more solid foundation, and it is our schools that can offer it to them. We talk about the labour of our heroes past, do our children know about this?